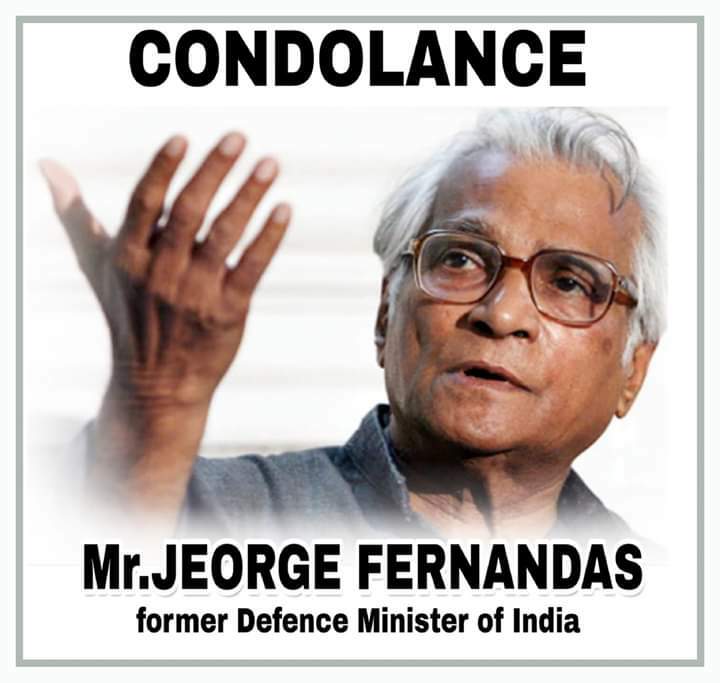 George Mathew Fernandes, a former Union Minister of Defence in the Vajpayee Government, died on Tuesday, 29th January 2019 in New Delhi. He was 88. He was a former Trade Unionist, Politician, Journalist, Agriculturist and a Member of Rajya Sabha from Bihar. .Fernandes, who suffered from Alzheimer’s disease, had swine flu for the last few days. A Veteran Parliamentarian who was first elected to the Lok Sabha in 1967, Fernandes served several times as a Union Cabinet Minister, holding portfolios such as Communications,. Industry and Railways, besides Defence. Fernandes won nine Lok Sabha elections from 1967 to 2004. Arrested during the emergency, Fernandes was the Industries Minister in the first non-Congress Government that came to power after the Janatha Party defeated Mrs. Indira Gandhi - whom Fernandes once called a “Congenital liar”. A native of Mangalore, Fernandes was sent to Bengaluru in 1946 to be trained as priest. In 194, he moved to Bombay, where he joined the Socialist Trade Union movement. Becoming a trade union leader, Fernandes organized many strikes and bandhs in Bombay in the 1950s and 1960s while working with the Indian Railways. He defeated S.K..Patil of Indian National Congress in the 1967 Parliamentary elections from the South Bombay ( now South Mumbai) constituency. Close after the struggle of Loco men under the leadership of All India Loco Running Staff Association (AILRSA) IN August, 1973, Annual Conference of All India Railway Men’s Federation (AIRF) was held. Sri Fernandes who was inducted from Central Railway by the National Railway Trade Uion (NRMU) gave the slogan of UNITED STRUGGLE for achieving the basic demands of Railway men., Sri Fernandes was that time Convener of United Council of Trade Unions (UCTU) which had already been heading some state wise industrial struggle and popular among the working class. He was the Chairman of Socialist Party. Sri Peter Alvares, who was a Member of national Executive of Socialist Party and had been functioning as President of AIRF opposed this slogan. Fernandes won the election against Peter Alvares as President of AIRF. In this background the AIRF gave call of holding a convention in Delhi on 27thFebruary 1974 for considering the steps to be taken for securing justice. The response was beyond expectation. National Coordination Committee of Railway men’s struggle (NCCRS) was formed. AIRF, AILRSA, AIREC, AITUC, CITU, BRMS and around 125 Railway Trade Unions joined hands with the biggest labour strike ever seen by the country, since the leaders called for conciliation were arrested strike pre-opened from 8th to 2nd May 1974.14 lakh employees participated and entire Railway traffic paralyzed . Around 1 lakh employees were removed from service under 14(ii)/149. 50,000 Casual Labourers were terminated without any notice, 30,000 employees kept under suspension – various type of harassment. The Railway Bureaucracy was able to mobilize a section of reformist leadership of AIRF and weaken the struggle. Finally the strike ended on May 28th, making a number of “alive martyrs’’ contributed by one or other. The leadership was under the illusion that successful strike even for 7 days would force the Government to come to a settlement. They never took into account the fact that the authorities were equally prepared for holding out in any strike for about 3 weeks or even more. Later in June 1975 internal emergency was declared by Smt. Indira Gandhi and the political background was changed. Fernandes went underground during the emergency era of 1975, giving a call to railway men to oppose emergency. The second leadership of AIRF disowned his instruction and as per the direction from Railway Board, George Fernandes has been removed from the post of President at the Annual General Body meeting held at Guwahati in his absence. He was challenging Prime Minister Indira Gandhi for imposing a state of emergency but in 1976 he was arrested and tried in the infamous Baroda dynamite case. In 1977, after the emergency had been lifted, Fernandes won the Muzaffarpur seat in Bihar in absentia and was appointed as Union Minister for Industries. During his tenure as Union Minister, he ordered American multinationals IBM and Coca Cola to leave the country, due to investment violations. He was the driving force behind the Konkan Railway project during his tenure as Railway Minister from 1989 to 1990. He was a Defence Minister in the NDA Government (1998 – 2004) when the Kargil Was broke out between India and Pakistan, and India conducted its nuclear test at Pokhran. 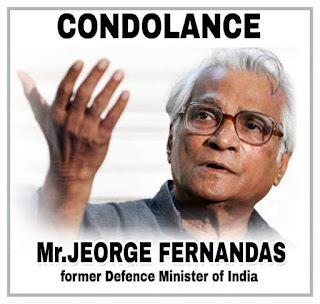 A veteran Socialist, Fernandes has been dogged by various controversies including Barak Missile Scandal and the Tehelka affair. He was accused in the 2002 coffin scam, following allegations that 500 poor quality aluminum caskets were bought from the United States at rates 13 times more than the actual price, to transport the bodies of slain soldiers, after the Kargil war…..